To apply for housing, log in to your MyBLUE account and click on "Tools". Then click the "Campus Housing" link. Click here for detailed instructions for completing the housing application. Start connecting with potential roommates! Best chance to get the room you want! Priority Room Selection email sent with time slot. Priority based on contract sign date. Log into MyBlue at your assigned time to choose your room. 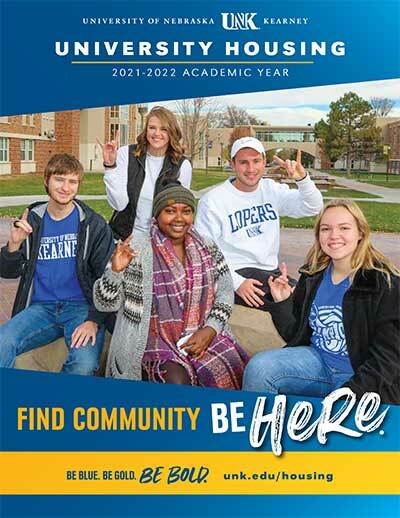 Contract cancellations must be sent via email by the student to housing@unk.edu. Changes needed after this date will be limited and based on availability. Whether you are forming groups to live in Antelope and Nester halls or just forming groups to live in a traditional hall this video will guide you through the process of forming, joining and verifying groups. This video will guide you through how to select both the residence hall and the room you can choose to live in.